Click for larger photo Source: Personal Collection Mission Impossible: IMF Agent's Rearview Sunglasses - 1996 Comes with long range listening device. Made by a company called simply "up,up & away" Promotion gadgets for the Mission Impossible in May 1996. IMF stood for "Impossible Missions Force". Here is a Wikipedia website on the Mission Impossible film. Click for larger photo Source: Personal Collection Mission Impossible: IMF Agent's Wrist Walkie-Talkies - 1996 Features pair of "Powerful Micro 49 MHz Secret Walkie Talkies". Made by a company called simply "up,up & away". Promotion gadgets for the Mission Impossible in May 1996. IMF stood for "Impossible Missions Force". Here is a Wikipedia website on the Mission Impossible film. 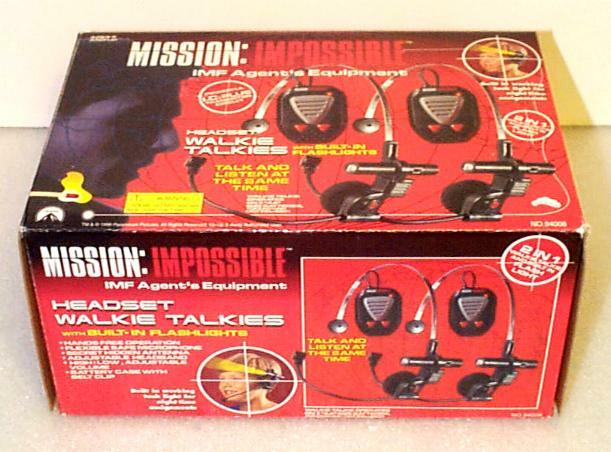 Click for larger photo Source: Personal Collection Mission Impossible: IMF Agent's Headset Walkie-Talkies - 1996 Comes with built-in flashlights. Made by a company called simply "up,up & away". 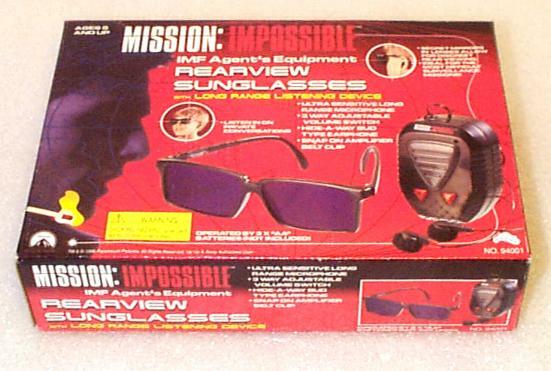 Promotion gadgets for the Mission Impossible in May 1996. IMF stood for "Impossible Missions Force". Here is a Wikipedia website on the Mission Impossible film. 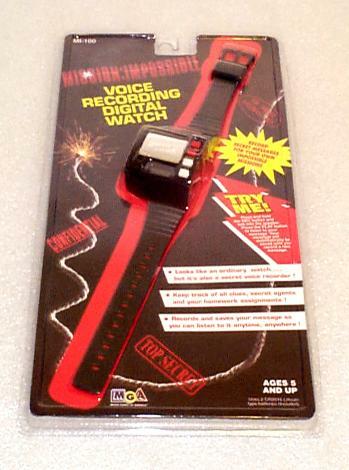 Click for larger photo Source: Personal Collection Mission Impossible: Voice Recording Digital Watch - 1996 Made by a company called "Micro Games of America". 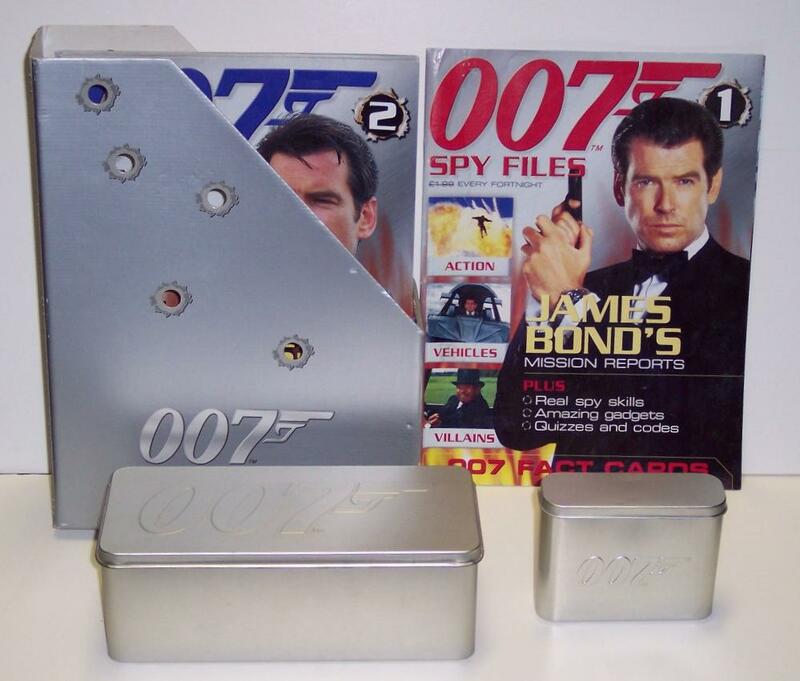 Promotion gadgets for the Mission Impossible in May 1996. IMF stood for "Impossible Missions Force". Here is a Wikipedia website on the Mission Impossible film. 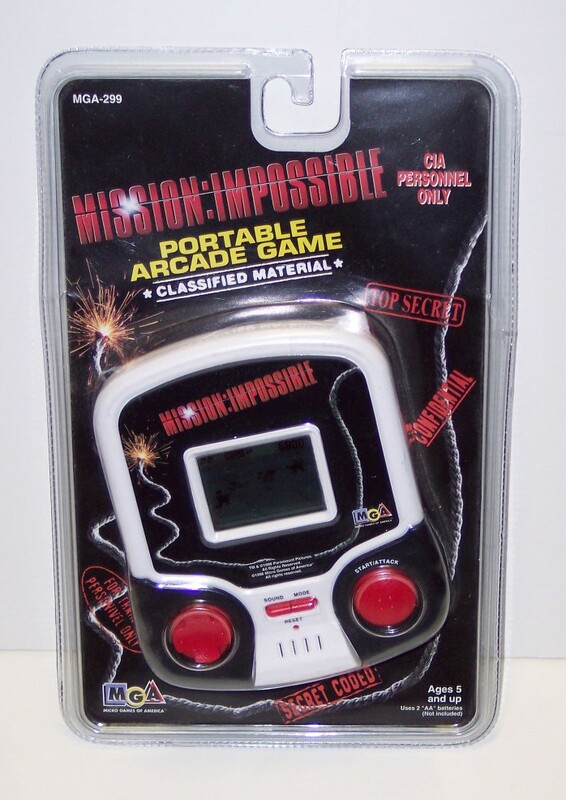 Click for larger photo Source: Personal Collection Mission Impossible: Portable Arcade Game - 1996 Made by a company called "Micro Games of America". 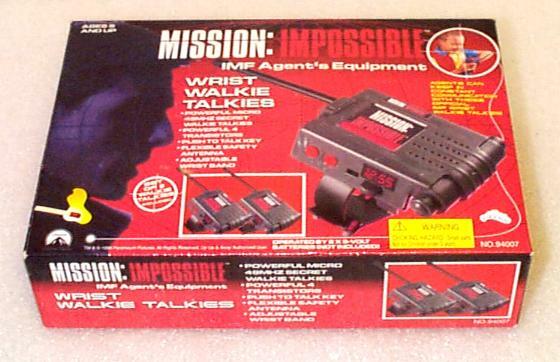 Promotion gadgets for the Mission Impossible film when it first came out in May 1996. IMF stood for "Impossible Missions Force". Here is a Wikipedia website on the Mission Impossible film. 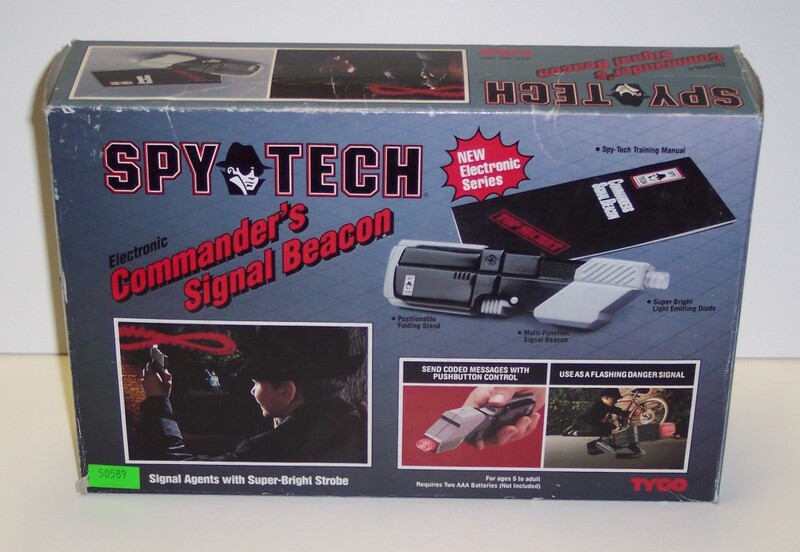 Click for larger photo Source: Personal Collection Spy Tech: Commander's Signal Beacon - 1991 Device comes with manual and was made by TYCO in New Jersey. You may wish to view a YouTube video promo Spy Tech gadgets from TYCO in South America. Here is a Seattle Times article of the Spy Tech gadgets when they first came out in the early 1990's. 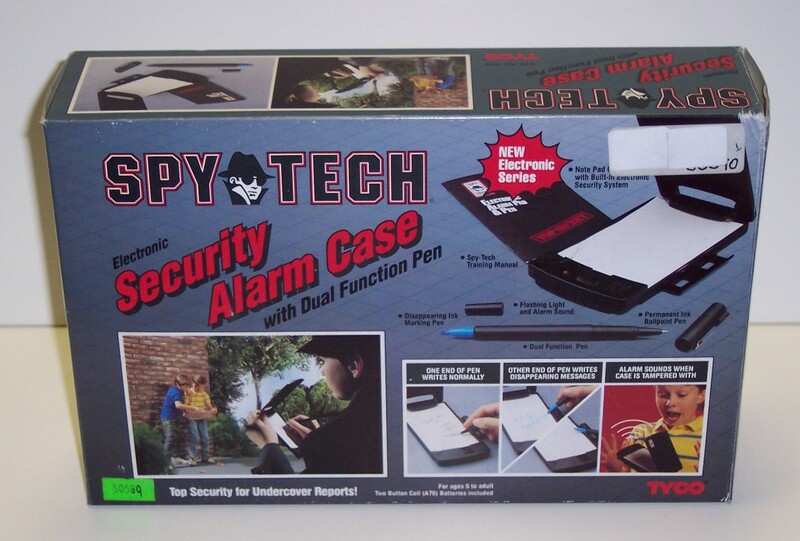 Click for larger photo Source: Personal Collection Spy Tech: Security Alarm Case - 1991 Device comes with dual function pen and was made by TYCO in New Jersey. You may wish to view a YouTube video promo Spy Tech gadgets from TYCO in South America. Here is a Seattle Times article of the Spy Tech gadgets when they first came out in the early 1990's. Click for larger photo Source: Personal Collection Spy Tech: Periscope - 1989 Real working periscope with spy accessories and was made by TYCO in New Jersey. You may wish to view a YouTube video promo Spy Tech gadgets from TYCO in South America. Here is a Seattle Times article of the Spy Tech gadgets when they first came out in the early 1990's. 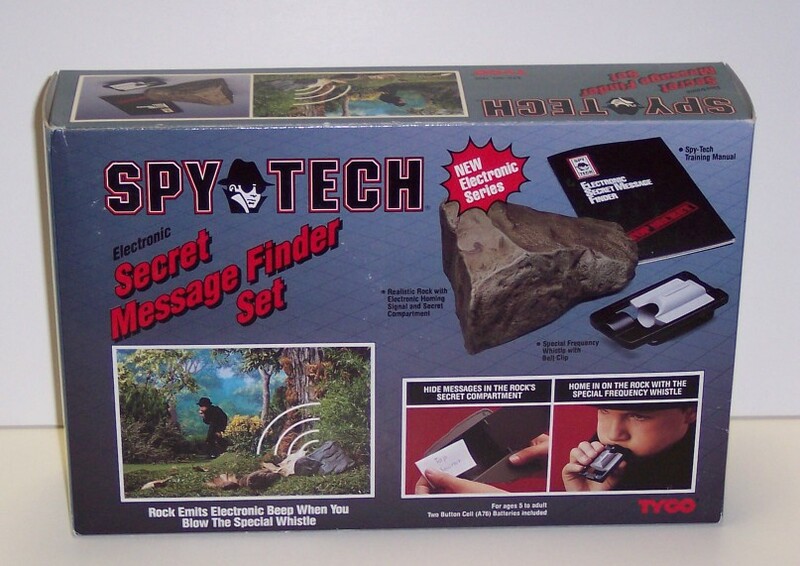 Click for larger photo Source: Personal Collection Spy Tech: Secret Message Finder Set - 1991 Comes with special frequency whistle with belt clip and was made by TYCO in New Jersey. You may wish to view a YouTube video promo Spy Tech gadgets from TYCO in South America. Here is a Seattle Times article of the Spy Tech gadgets when they first came out in the early 1990's. 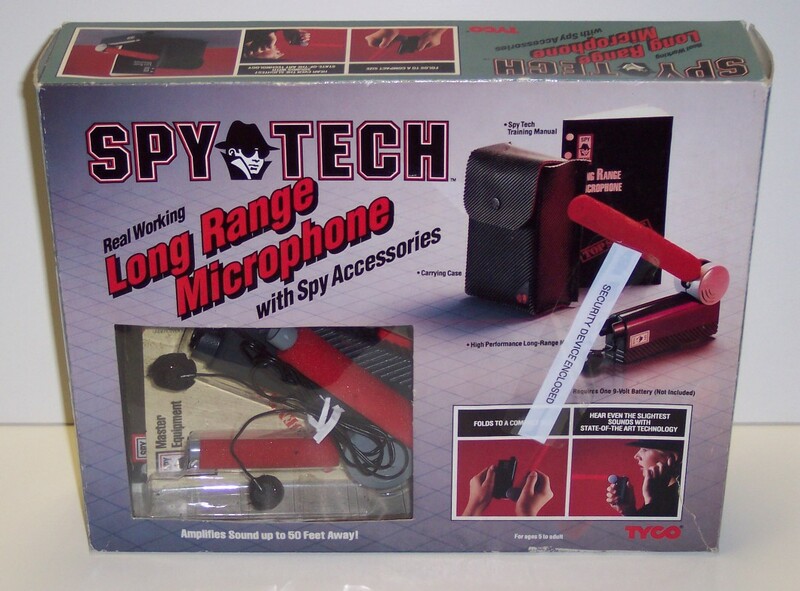 Click for larger photo Source: Personal Collection Spy Tech: Long Range Microphone - 1989 "Real working long range microphone with spy accessories" and was made by TYCO in New Jersey. You may wish to view a YouTube video promo Spy Tech gadgets from TYCO in South America. Here is a Seattle Times article of the Spy Tech gadgets when they first came out in the early 1990's. 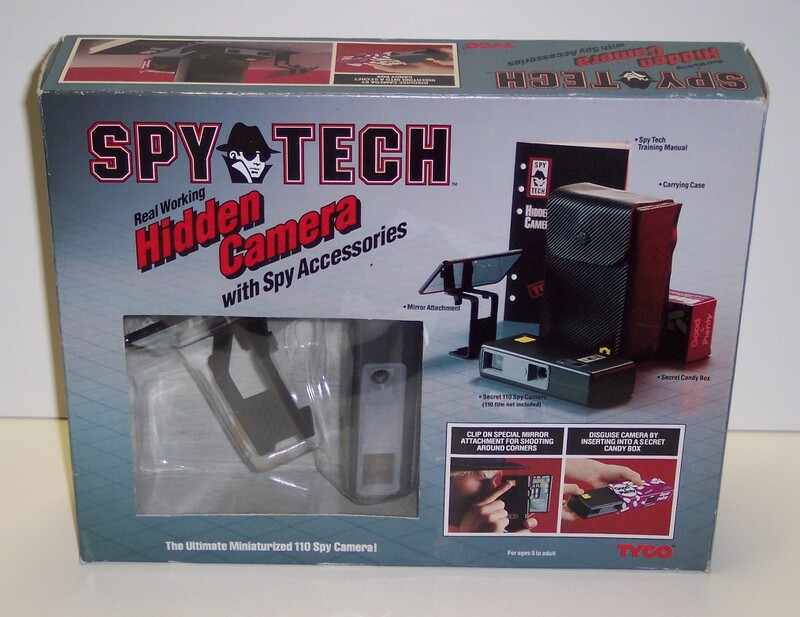 Click for larger photo Source: Personal Collection Spy Tech: Hidden Camera - 1989 "Real working hidden camera with spy accessories" - contained 110 film camera concealed in secret candy box and was made by TYCO in New Jersey. You may wish to view a YouTube video promo Spy Tech gadgets from TYCO in South America. Here is a Seattle Times article of the Spy Tech gadgets when they first came out in the early 1990's. 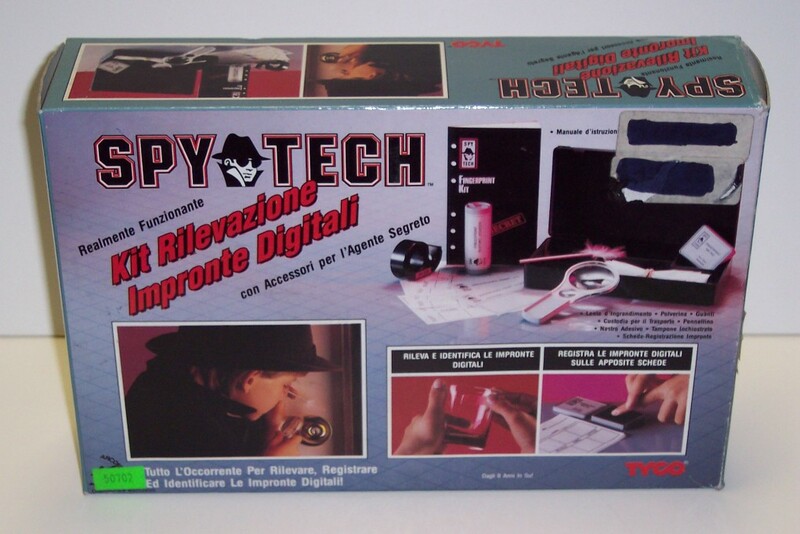 Click for larger photo Source: Personal Collection Spy Tech: Digital Fingerprint Kit - no year printed but likely 1989 to 1992 Printed in Spanish which translates to "Real working digital fingerprint kit with spy accessories" and was made by TYCO in New Jersey. You may wish to view a YouTube video promo Spy Tech gadgets from TYCO in South America. Here is a Seattle Times article of the Spy Tech gadgets when they first came out in the early 1990's. 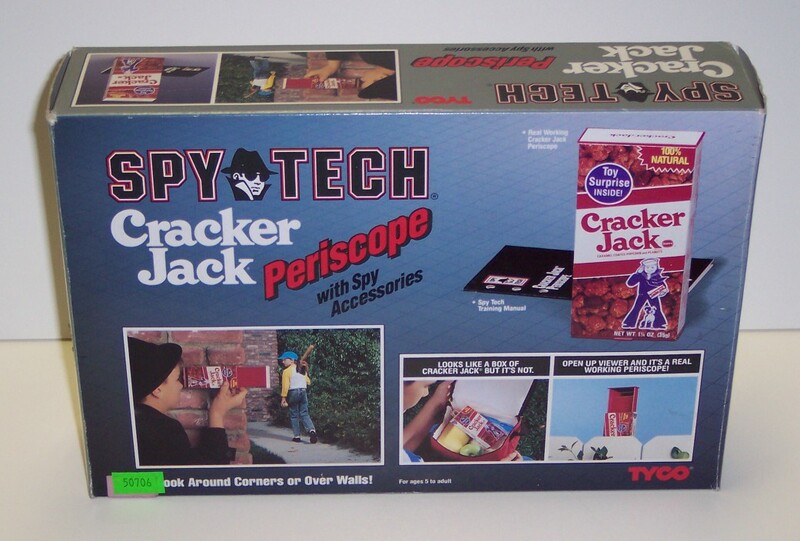 Click for larger photo Source: Personal Collection Spy Tech: Cracker Jack Periscope - 1992 "Cracker Jack Periscope with spy accessories" - comes with Spy Tech Training Manual and was made by TYCO in New Jersey. 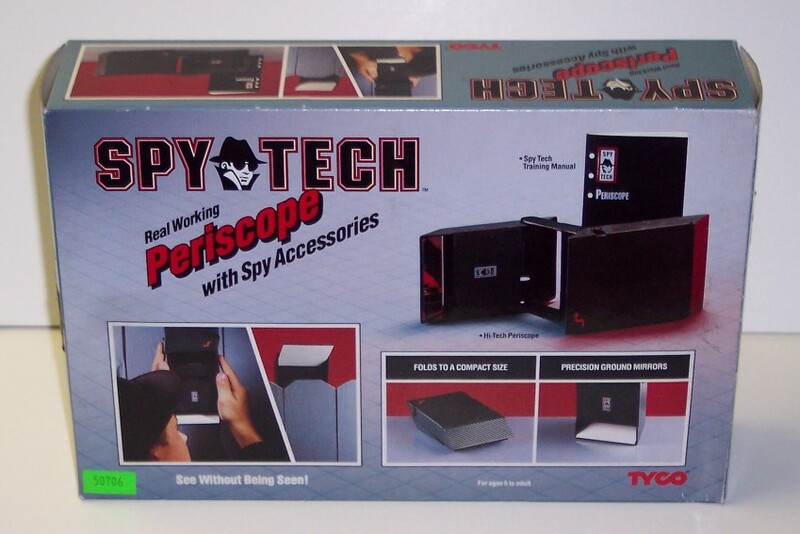 You may wish to view a YouTube video promo Spy Tech gadgets from TYCO in South America. Here is a Seattle Times article of the Spy Tech gadgets when they first came out in the early 1990's. 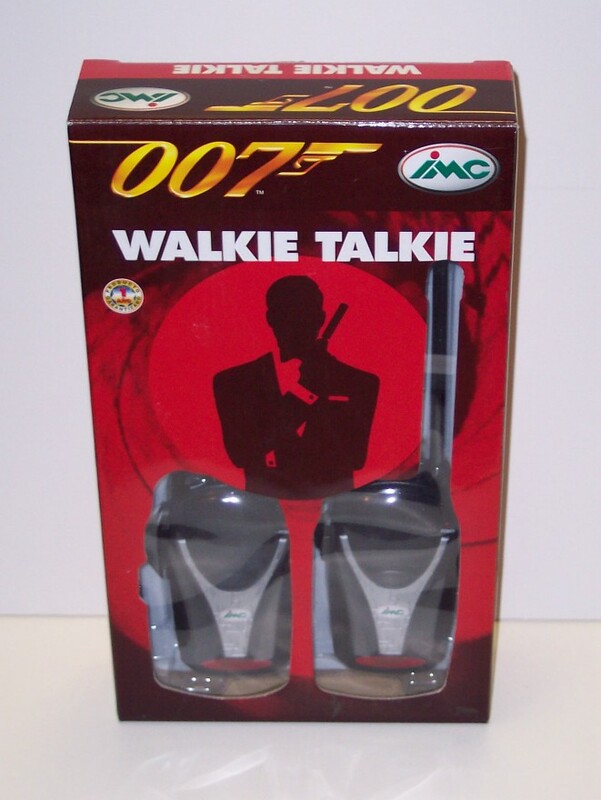 Click for larger photo Source: Personal Collection IMC 007: Walkie Talkie Set - Circa 2001 IMC box written in Spanish and Portugese and was made by IMC in Barcelona Spain. Here is a Web profile of the (IMC) Imcadisa company. 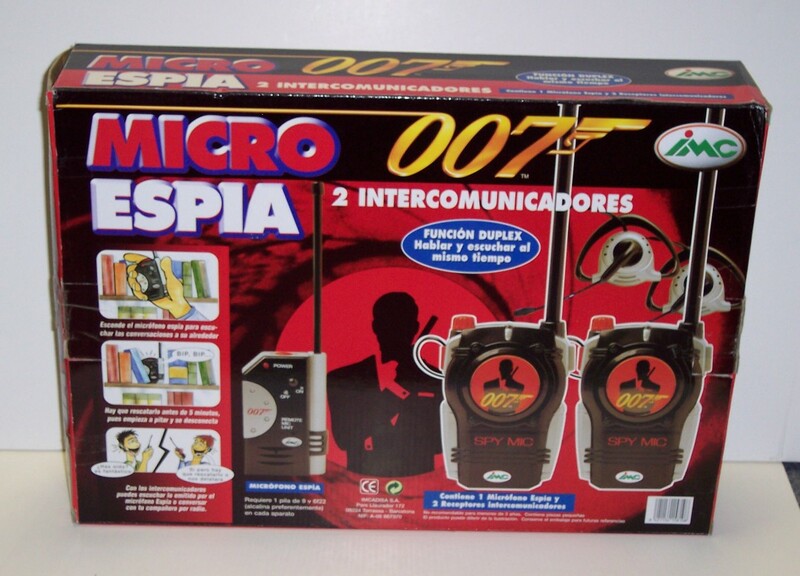 Click for larger photo Source: Personal Collection IMC 007: Micro Spy Receivers and Clipsets - Circa 2001 IMC box written in Spanish and Portugese and was made by IMC in Barcelona Spain. Here is a Web profile of the (IMC) Imcadisa company. 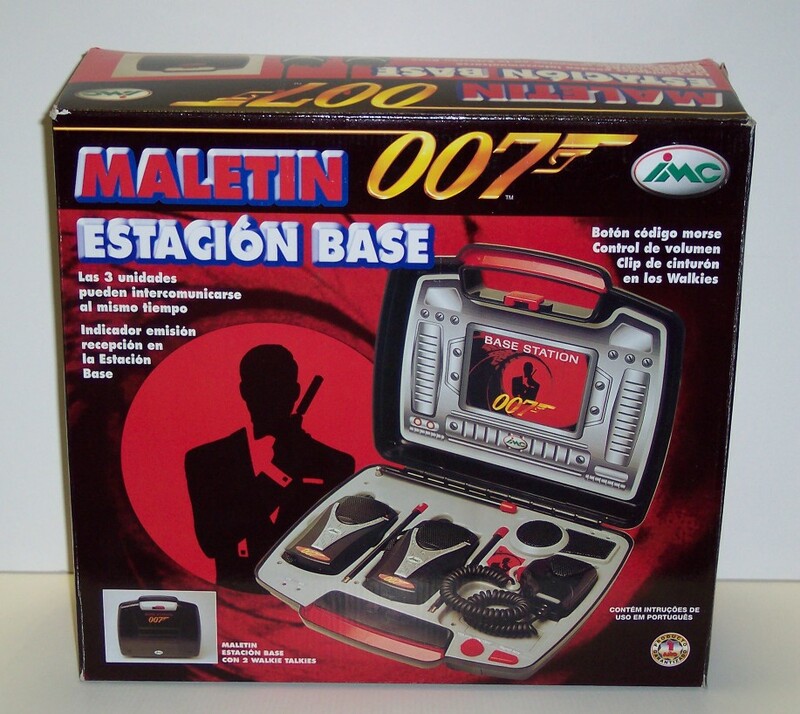 Click for larger photo Source: Personal Collection IMC 007: Spy Base Station in Attache Case - Circa 2001 IMC box (written in Spanish and Portugese) contains two walkie talkies and was made by IMC in Barcelona Spain. Here is a Web profile of the (IMC) Imcadisa company. 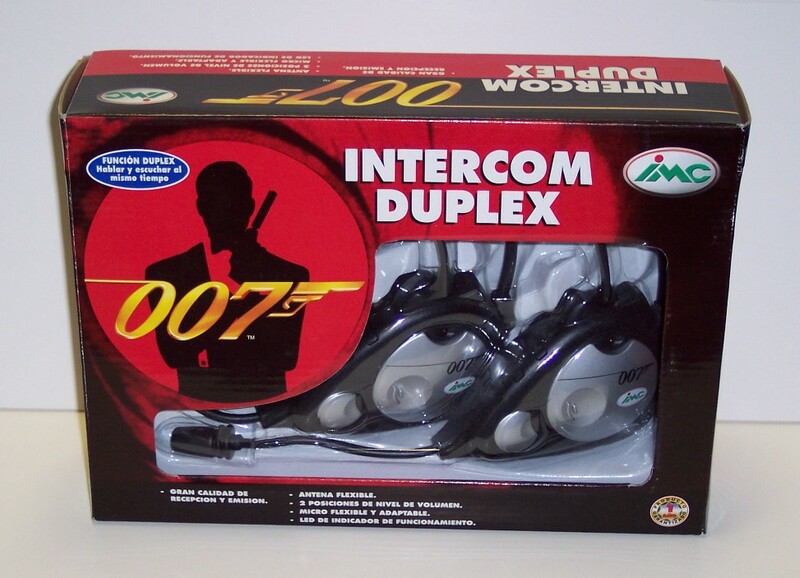 Click for larger photo Source: Personal Collection IMC 007: Duplex Headsets - 2001 IMC box written in Spanish and Portugese and was made by IMC in Barcelona Spain. Here is a Web profile of the (IMC) Imcadisa company. 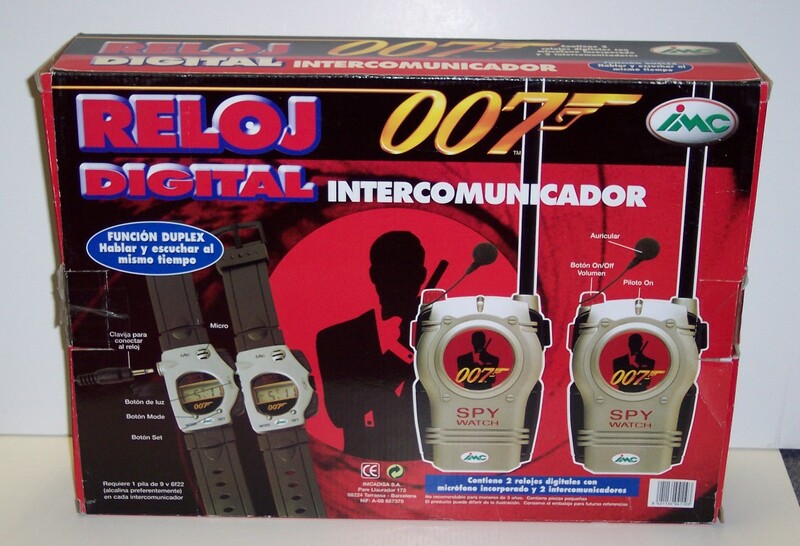 Click for larger photo Source: Personal Collection IMC 007: Digital Intercom Watch - Circa 2001 IMC box (written in Spanish and Portugese) contains two digital microphone watches and two receivers - made by IMC in Barcelona Spain. Here is a Web profile of the (IMC) Imcadisa company. 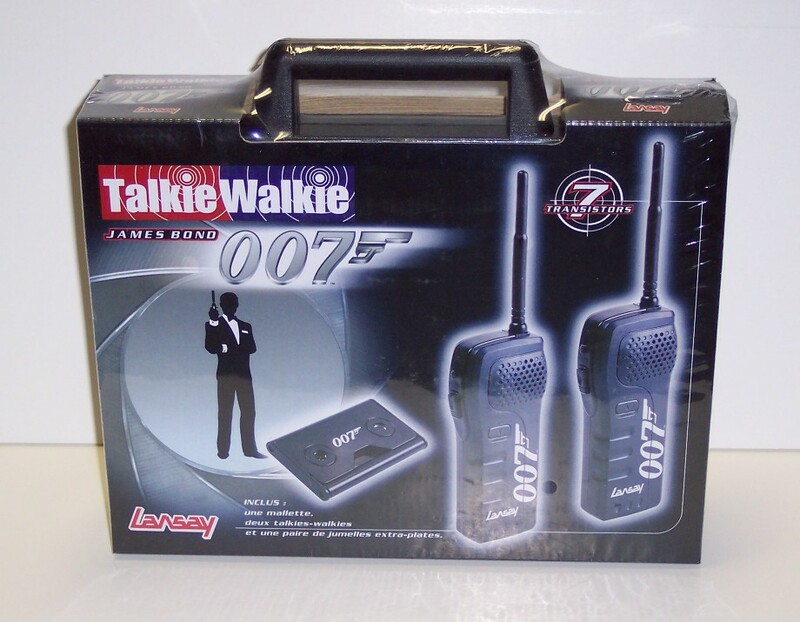 Click for larger photo Source: Personal Collection Talkie-Walkie 007 par Lansay - 1999 Jumelles et talkie-walkies (avec 7 transistors) dans une super mallette - fabriqués par la compagnie Lansay. Voici un profil web de la compagnie Lansay. Click for larger photo Source: Personal Collection British Promotion - Spy Files 007 - 2002 Promotion and publication by Eon Productions Limited. Here is a Wikipedia profile on Eon Productions. Here is another web profile on the 007 Spy Files publication. Click for larger photo Source: Personal Collection Spy Ring Game - 1965 Board game by Waddington for 2 to 4 players. Here is a website profile of the game itself. 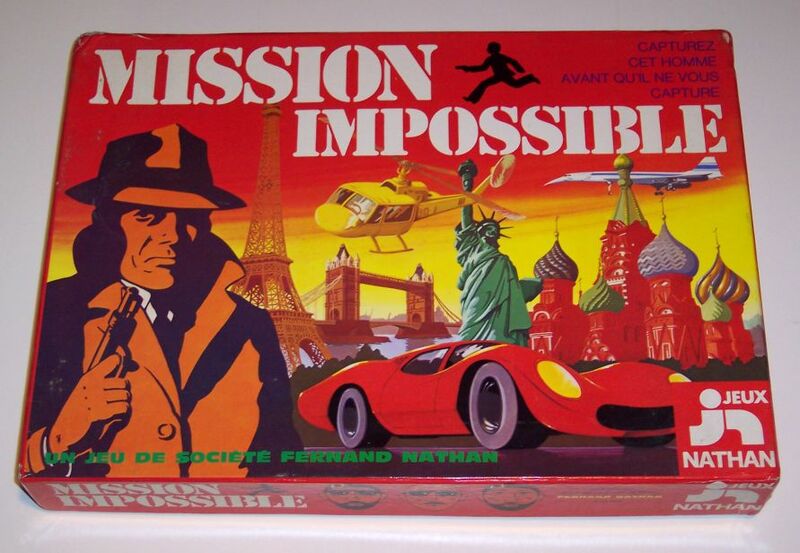 Click for larger photo Source: Personal Collection Jeu de société Mission Impossible - 1977 Jeu de société par Jeux Nathan pour 3 à 6 joueurs. Voici un site Wikipédia sur "Jeux Nathan" en France depuis 1974.